CYO activities with a new theme each week. 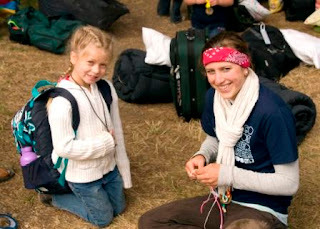 It is open for campers going into grades 1-8, with smaller groups divided by age. It is the perfect opportunity to experience camp for the very first time or in an entirely new way! Transportation and scholarships are available. Sights and Local Delights (gr 1-8): Enjoy the best activities Camp Don Bosco and the surrounding area has to offer! Take a swim in the pool, hike in the woods, work on a craft project and make new friends. You will also have the opportunity to explore area sights such as Snoqualmie Falls, Remlinger Farms and explore the Snoqualmie Valley Trail. Let’s Get Crafty! (gr 1-8): Spend two hours a day in our craft shop creating your own masterpiece! This is your chance to be as creative as you want. We will paint, draw, mold, tye-dye, make candles and much much more! Horsin’ Around (gr 1-8): Become a cowboy or cowgirl this week! We will spend time down at the corral with our highly trained staff, learning about horses, sharpening our skills and even going on a trail ride. Take a trip back to the Wild West with an authentic cowboy cookout over the campfire. Let’s Make Some Music (gr 1-8): By making our own instruments, learning about music and having numerous jam sessions, you will find your own unique sound. Whether you decide to make a music video, choreograph a new dance or just learn a new song, the possibilities are endless! We will even pay a visit to Experience Music Project in Seattle to discover the secrets of some of the greatest musicians. Gamesapalooza (gr 1-8): A week full of games and activities that focus on having fun, developing sportsmanship, and learning to be a team player. You’ll enjoy new games ranging from tag to Ultimate Frisbee. Photo Camp (gr 1-8): Learn about the art of digital photography! Light, composition and subject matter are just some of the skills you will learn this week! What a great way to capture the beauty of God’s creation! Wildlife Wonder (gr 1-8): What is your favorite animal? This might be the week to decide! We will meet several different types of animals during our visit to the Woodland Park Zoo, where we will stay the night and have a pizza party. Also become an expert animal tracker as we discover the wildlife that lives all around us. All the Camp’s a Stage (gr 1-8): This is your chance to shine! Get in touch with your artistic side this week, perhaps by working on some new acting skills, painting a mural or even sculpting a masterpiece. We will even get a special visit from the Seattle Children’s Theater, who will give us the inside scoop on becoming a star. Outdoor Adventure (gr 1-8): End the summer by enjoying every second of sunshine. We will go hiking, swimming, canoeing, and exploring everything we can in a week! This is the perfect opportunity to brush up on your outdoor skills, as you learn how to make a fire, build a fort and identify the local plants. High Adventure (gr 1-8): Are you ready for high and low adventures? This week we will take full advantage of Camp Hamilton’s new high challenge course and their climbing wall! We’ll also go hiking, swimming, and canoeing! We’ll round out our week with an overnight at camp!